Several World War II veterans will highlight activities at the third annual Atlanta Warbird Weekend at Dekalb-Peachtree Airport (KPDK) Sept.24-25, 2016. The event at the Chamblee, Ga., airport is a community effort led by the Commemorative Air Force (CAF) Dixie Wing, the Georgia Chapter of the world’s largest WWII flying collection. This year’s program will celebrate the 75th anniversary of the American Volunteer Group (AVG), nicknamed the Flying Tigers. 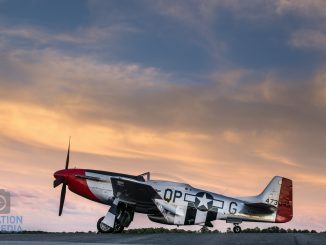 AWW will host the largest gathering of P-40 Warhawks in 50 years, with at least 10 of the historic planes expected at the airport. The Curtiss P-40 was highly associated with the Flying Tigers and was the third- most- produced fighter plane of WWII. Very few are still flying and the AWW event will be a rare opportunity to see these aircraft together and hear from actual veterans who served with the Flying Tigers, as well as hear from other WWII veterans who will be present to discuss their experiences. Frank Losonsky, Chairman of the AVG Flying Tigers Association, will be participating for the weekend. Frank was recruited into the AVG from his duties in the US Army Air Corps at Selfridge Field, Michigan. 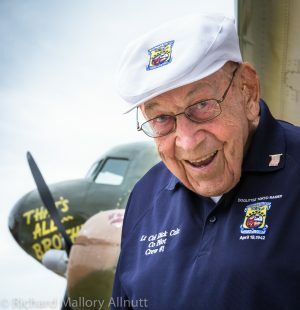 He was assigned as a Crew Chief in the “Hell’s Angels” 3rd squadron, where he generally was responsible for three to four aircraft at a time. 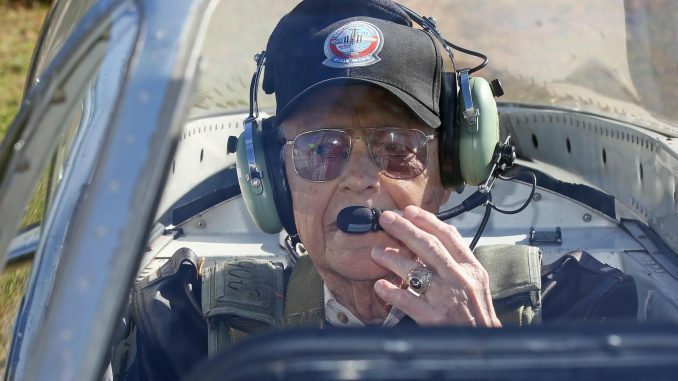 In addition to these duties, he also carried out memorable tasks such as delivering bombs via truck from Kunming to Paoshan, and salvaging parts from ill-fated P-40s. On one occasion, Losonsky was part of a salvage crew sent to recover four wrecked Tomahawks. The flight of four planes, led by Gregory “Pappy” Boyington, had made forced landings near the Indochina border when they ran out of fuel. Honorably discharged from the AVG, Frank returned home, married, and then returned to the Far East as a mechanic with Chinese National Aviation Corporation (CNAC). Later, he returned stateside and assisted in building B-24 Liberators. 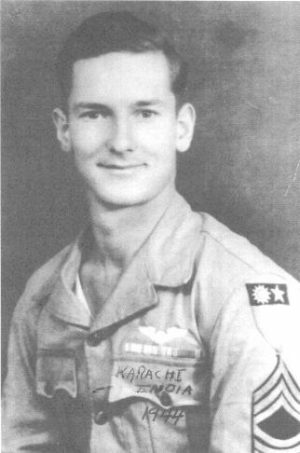 Leaving the Air Corps, Losonsky took a civil service job at Clark Field in the Philippines. Following WWII Frank remained in the Far East and attained one of his earliest goals — to become a commercial pilot. He flew for TAA (TransAsiatic Airlines). In 1950 he left TAA and returned to the States. He joined GM and traveled the world for 30 years as a service rep for the GM Allison aircraft engine division. Frank’s finale was to serve as an Exec. Officer in his son’s PART IV restaurant business in Columbus, Ga.” In 1996 Frank was awarded a Bronze Star Medal by Chief of Staff USAF, Gen. Ronald Fogleman. The AVG Flying Tigers were granted veterans status in 1991 and awarded a Presidential Unit Citation in 1992. Charles “Chuck” Baisden, vice president of the AVG Flying Tigers Association, also will be present for the special AVG weekend. He signed a one-year contract with Central Aircraft Mfg. Co., covert cover for the AVG, and worked as an armorer on 3rd Squadron P-40Bs and P-40Es. 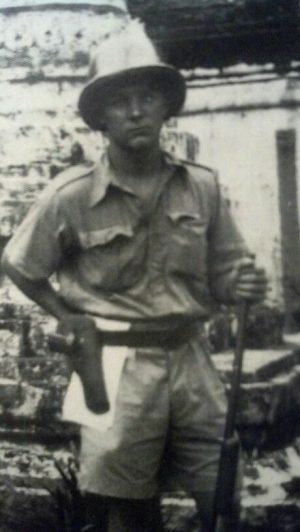 He was with the first forces to reach Burma, and first of the AVG to reach Toungoo in August 1941. Baisden was stationed at Mingaladon and Magwe, Burma; Loiwing, Mengshi, and Kunming, China, and did the Burma Road by truck. He once was sent to Maymyo, Burma, via Mandalay to pick up 55,000 rounds of aircraft ammunition. Baisden also served in WWII and Korea, for which he earned the following decorations: Distinguished Flying Cross; Bronze Star; Air Medal; four Presidential Unit Citations; Air Force Outstanding Unit Award; SAC Crew of the Month; Two Korean Unit Citations; China National Service Medal; Combat Ready. 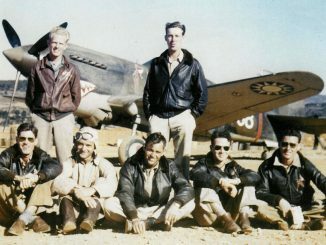 The Flying Tigers were recruited under secret presidential authority and commanded by Claire Lee Chennault. 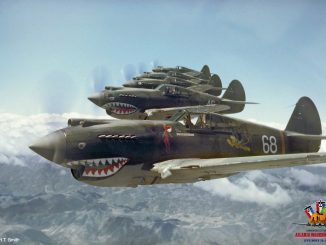 The shark-mouth nose art of the Flying Tigers remains among the most recognizable images of any individual combat aircraft or combat unit of World War II. The AVG Flying Tigers Association will celebrate its reunion in conjunction with the AWW. Presentations at AWW, and leading up to the event, will be organized to educate and connect the public with the historical significance of the American Volunteer Group. 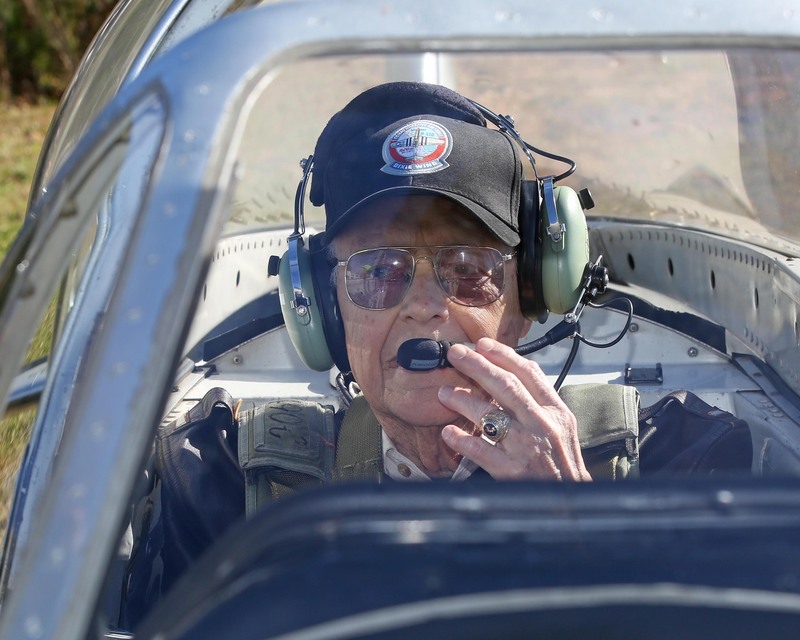 Other veterans expected for AWW are WWII veteran pilots Bob Jones, who flew C-47 and the C-46 Commando over the “Hump” in the Himalayan Mountains; Paul Crawford , who Flew 29 missions in P-51s and flew P-40s for Chennault in the 14th Air Force; plus Albert McMahan, a B-17 ball and tail gunner who flew 25 missions in the dark early days of the 8th Air Force when there were no friendly escorts, and Henry Hughey, who flew as a ball turret gunner with the 487th Bomber Group (Gentlemen from Hell) later in the war and completed 32 missions. AWW will be open from 9 a.m. to 4 p.m. each day Sept. 24-25 at the Dekalb-Peachtree Airport. For a complete schedule of activities and CAF aircraft flight prices and reservations, visit www.atlantawarbirdweekend.com. The mission of the Texas-based CAF is to honor veterans and American military aviation through flight, education and remembrance.